The second in a series of articles I'm writing on photographic composition. This article discusses the important issue of 'balance'. In 2010 I prepared a powerpoint presentation and image slideshow for a talk that I gave to my local photographic society. It lasted about 90 minutes and covered my approach to photographic composition. The diagram above is from the introduction to the talk. You'll notice straight away from the red circle in the middle that I consider 'Simplicity' to be the issue that is of most importance and I discussed this in the previous blog article on the 'KISS' technique. The follow-up articles that I'll be writing over the next few months will cover the issues shown in the blue circles on the diagram: those of 'Emotion'; 'Light & Form'; 'Frame Edges & Visual Separation' and today's blog article on the subject of 'Balance'. 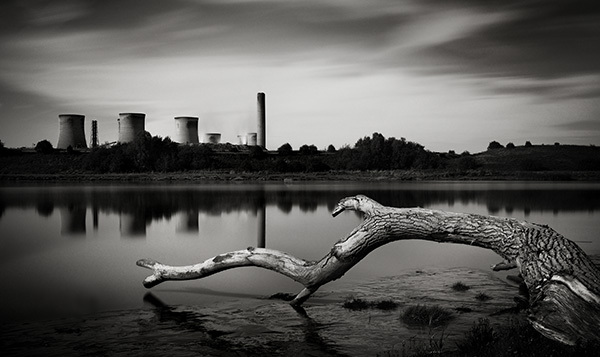 In classic landscape photography you will often see scenes that, compositionally, are using the same principles as the photo above where the subject of the image, in this case a coal-fired power plant in northern England, is balanced by a strong foreground element. 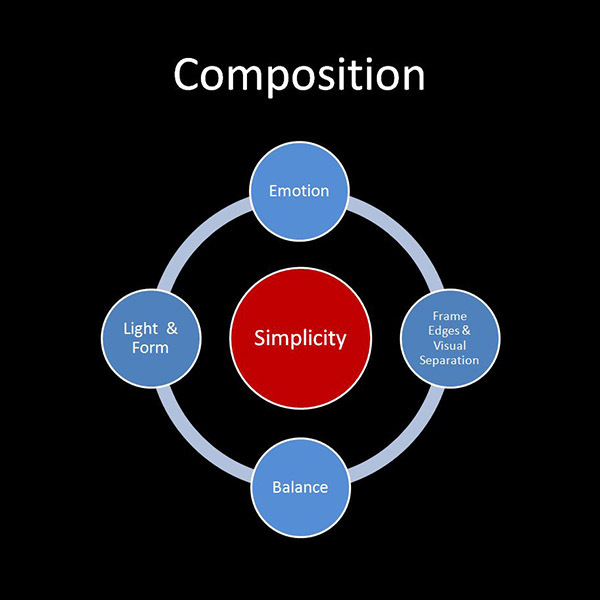 You can however take these classic ideas of balance in composition and introduce your own twist to them. The power plant in this photo is visually counterbalanced by the dead tree in the same way that a classic rural landscape photo might balance a mountain vista with a foreground of apline flowers in bloom, but here there is an extra twist in that there is another type of balance that is created in the photo - it's that strong visual and emotional connection between the idea of the power plant and it's known effects on the environment. In this article I'll start by explaining the basics of how to achieve classical visual balance in your photos but I'll also then go further and look at some ideas to show you how you can add that extra visual 'twist' to your photos - the things that take 'balance' beyond the mundane to elevate your photos above the ordinary. Thoughtfully balanced and harmonious photos can be beautiful to look at but it's the extra thought that you bring to them that will make your photos really stand out from the crowd. As an architect I've been dealing with issues such as aesthetic balance in building design, light & shade, colour and tone all my adult life so I tend to trust my instincts when composing a photo in the viewfinder, however I would imagine that if you have a scientific background rather than an artistic one you may be struggling with some of the basics. One of things I learnt when I was still a student was that proportion and composition in architecture are closely linked to the basic principles of maths and music so this got me wondering if there was a logical way to explain some of the basics of composition to the more mathematical minded who may be new to photography and the whole issue of compositional balance. As a student of architecture we also had to learn how to design basic reinforced concrete beams and it occurred to me that simple force diagrams hold strong links with some of the principles of balance that I subconsciously use when I'm looking through the viewfinder. Taken to the extremes of simplicity the principles are the same as those of a seesaw and I've done a few sketches to illustrate what I mean. Before I explain further it's important to realise that, like a seesaw, the plumb center of the photo is a hot spot around which all balance in the composition of the photo revolves. Everyone understands the basic idea behind a seesaw as in the sketch above...if you have two people of equal weight they need to be equidistant from the center fulcrum, however it is also possible to balance the seesaw with two people of widely differing sizes and weights by making the larger one sit closer to the fulcrum as in the sketch below. The same principles of balance apply exactly when you are composing a photo if you think of the centre of the image as being the fulcrum about which the differing elements need to balance out in their visual weight and importance within the overall image.....generally speaking the further an element in a photo is away from the centre the more power it holds so a smaller element on the edge of the frame can counter balance a larger one nearer to the center. This idea is not just limited to the fundamental size of the object but also it's colour and tone....a small vivid, red or yellow coloured object in an otherwise plain image can balance out a much larger lesser coloured one elsewhere in the frame. Likewise in mono photos the variation between light and dark objects in the composition and the quality of tones is fundamental to their importance and visual 'weight' within the overall image. Obviously these same principles apply in the 3D view we get through our viewfinders with the object of balancing out elements between foreground and distance .....hence why so many landscape photographers go on so much about the importance of balancing a good vista with a nice foreground. Although I believe we can all appreciate the beauty in classically balanced and harmonious photos the dilemna is that they can also be boring once you become more experienced as a photographer. Once you've achieved a certain knowledge of the basics in photography my advice would be to experiment as much as possible with your photos and have fun. If you are having fun and enjoying your photography you'll feel inspired and it's through inspiration that you'll grow into a better and more adventurous photographer. Try things that are new to you - for example, one of my personal dislikes in photography is when 'rules' of composition are quoted. There are no such things as rules in the arts - photos either work or they don't so one idea that you might try would be to take photos that deliberately break all the rules - why not start with the so-called 'rule of thirds'. I'm lucky that I travel quite a lot to Paris as we have friends and family who live there. For a long time however I avoided visiting the Eiffel Tower with my camera as I assumed that with such a well known and photographed iconic structure that it would be impossible to take a photo of it that would offer anything new or different. 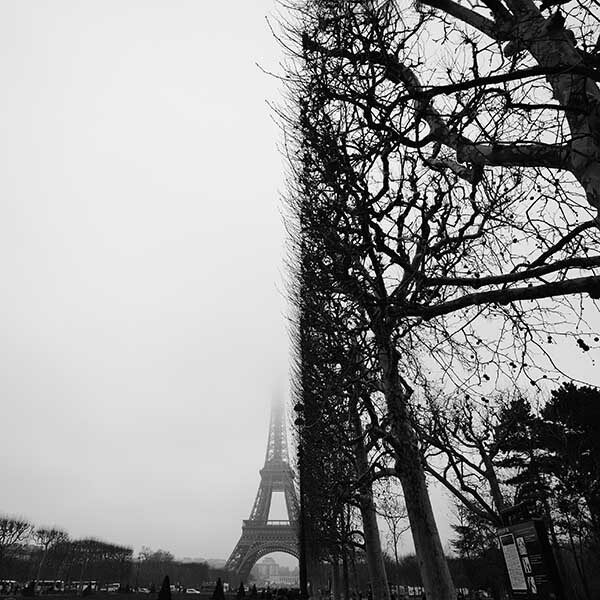 When I eventually did go there with the camera I happened to have a wide angle lens with me and this was the view that I saw as I looked through the viewfinder - the French cut the trees along the Champ de Mars with the precison of a military haircut and the formality of this centered composition with the Eiffel Power partly hidden behind the hedge really jumped out at me. It's very unusual that I think I've taken a photo that is truly original but this is one of them. Personally speaking, I've found it impossible to constantly produce photos that I think have an element of true originality in their composition so where is that extra something going to come from in our everyday photos that we have composed using that classic foreground-background balance that we talked about earlier? The answer for me usually lies in finding great light. Finding unusual or beautiful light to include in your photograph can often bring an emotional content to the resulting images. The importance of both light and emotion to great photos are things that I'll discuss in later articles but if you can bring them together in a photo that is also nicely balanced and simple then they will usually add that extra spark that is needed to raise the photo above the ordinary. 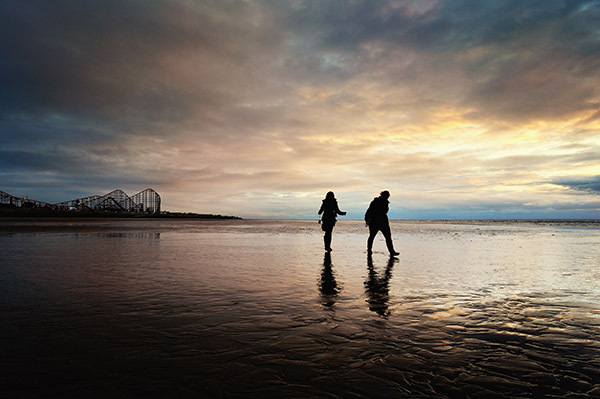 The photo above is one I took at dusk on the beach in Blackpool, NW England. Apart from the foreground-background element the image is not really composed according to any of the recognised rules as neither the position of the horizon nor the position of the two people follow the rule of thirds yet it works because of the simplicity, the great light and the fact that it seems to be telling a story. In summing up, I'd warn that, although classical balance in photographic composition is a relatively easy subject to master, if you are truly interested in producing photos that have artistic merit then you will need get away from the idea of following rules or formula and try and bring something a little different to your photos - something of yourself to make them stand out from the crowd.